This is the high quality, officially licensed Lord Of The Rings movie prop replica Sting Sword. Features a dual edged 420 tempered stainless steel leaf shaped blade etched with Elvish runes. The beautiful hardwood handgrip is adorned with Elven vine design. Solid metal guard and pommel with antiqued metal finish. Rat-tail tang construction. Includes a hardwood wall display measuring 9-3/16" x 11-3/8" x 3/4" with a wood grain finish and silk screened Elven runes. Hardware, instruction sand certificate of authenticity included. A true collector's piece for those who wish to own a magical piece of movie history. See Model UC2893 for the STING SCABBARD sold separately. 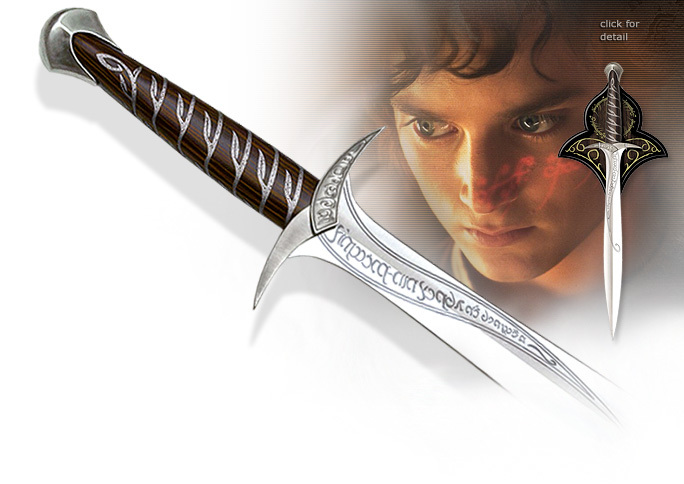 A magical sword given to Frodo Baggins by his cousin Bilbo, the original Ringbearer. It is up to Frodo and the chosen "Fellowship" to cast the Ring back into the fires of Mount Doom, where it was originally forged, and destroy it once and for all. Bilbo gives Sting, a sword made by Elves in the ancient days, to Frodo to serve him on his harrowing journey. Bilbo carried Sting with him when he originally acquired the Ring from Gollum. Sting's blade glows when Orcs, the violent footsoldiers of Sauron, are present. Engraved on the blade and cross guard are runes in the Elven language of Sindarin that translates as, "Maegnas is my name, I am the spider's bane."